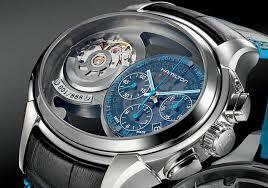 It’s no secret that Hamilton watch company is one of my perennial favorites when it comes to watch brands. For the money they offer one of the best values in the world of watches; great design and style, nice materials like sapphire crystals, titanium and stainless steel cases, and great automatic ETA movements. Being part of the Swatch group, they have access to the full range of ETA movements and use them quite well as their “in-house” movement. Eta is nothing to sneeze at either, they are robust , accurate, easy to maintain and relatively inexpensive. So, now that you know why I like Hamilton so much, you have got to see what they are releasing that really gets me excited.